The online wargame “World of Tanks” has become a phenomenon and has thousands of players worldwide being able to select any tank from WWII and use it against other players on line. But like all games of this sort, it has acquired a “geek”-like panache for historians and modelers and many of them avoid anything to do with as a matter of course. 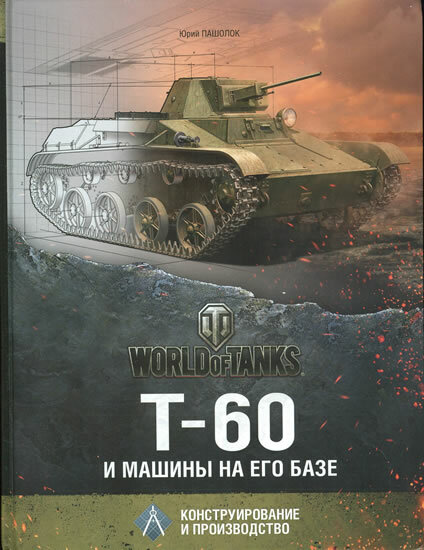 Over the past year or so, the designers and backers of the game (Russians) have also started to produce a series of upscale, high quality books on specific items within the WoT game and what their research into the vehicles yielded. Some have appeared a bit dodgy or too close to “Dungeons and Dragons” material (there is one on “Ball Tanks” out now) but others actually are very, very good and of great use to any Soviet tank historian or modeler. This book by Yuriy Pasholok is one of the latter. I have followed Yuriy’s website for a couple of years now (http://yuripasholok.livejournal.com) and have enjoyed the fact he shares a lot of materials from the Russian State Archives on line. This book is a product of the research carried out by Yuriy and a number of his friends from those archives, and is presented here with numerous 1/35 scale plans drawn up by Yuriy for the book. The T-60 light tank was an evolutionary vehicle based on the previous T-40 amphibious light tank, both of which were designed by Nikolay A. Astrov. The T-60 design was a non-amphibious tank which used parts from the last version of the T-40, the 20mm ShVAK armed T-30, and a new lower and better designed hull with better ballistic protection. When the war broke out in Russia on 22 June 1941, shortly afterwards the government began to strip down its prewar industries to prepare for high volume production. The T-20 Komsomolets tractors and T-40/T-30 tanks were ordered terminated, and the hope was that the new T-50 light tank could be quickly rushed into production to fill the gap. But it was too complex and too heavy, with only tank factories able to assemble the vehicle. A light tank that could be quickly produced by auto factories was seen as a good stopgap measure, and the T-60 tank appeared to fill the bill. It was ordered into production starting on 20 July 1941 at three factories with as many as eight more planned to join in production as documentation could be prepared and sent to them. The tanks were in production into late 1942 when fully replaced by the heavier T-70 series of tanks. Yuriy covers the developmental history of the tank and shows a number of variations as built by different factories such as No. 37, No. 38, the Stalingrad Tractor Factory, and others. The different variations are all covered and details are shown as well - different road wheels, drivers, idlers, exhausts, turrets, and also a number of experimental modifications. Two versions of the T-60 fitted with experimental 37mm guns, the prototype T-60Z antiaircraft version with twin DShK machine guns, a Hetzer-like 45mm self-propelled antitank gun, a universal extended chassis (which was the basis for the later T-70 based SU-76 and ZSU-37 self-propelled mounts), a armor trailer based on the T-60, and even armored sleds based on its hull are presented and covered. There is also a bit of coverage of the curious KT concept for a winged tank (wings on a T-60 tank chassis). The only major drawback of the book is the fact that all of the text and captions are in Russian. Most are apparent (No. 37 is the same in both English and Russian, so most of the factories can be sorted out) but others do require some linguistic skills. Overall, if you are a fan of the little tank this is a great reference for modeling and provides nice, new, crisp plans of each sub-variant.